A 33-year-old man has been charged with four offenses stemming from the robbery of a convenience store over the weekend. At approximately 3 a.m. Saturday (February 8), two men entered a convenience store at the corner of Kinoʻole Street and Hoku Street. One of them purchased several items and then threatened to shoot the clerk if he didn’t let him take a package of cigarettes without paying. When another customer entered the store, the two men left. Police investigation led to the identity of the suspect as 33-year-old Jamal K. K. Hauoli-Ontai, who has no permanent address. He was located at 5:40 p.m. Saturday at the Moʻoheau bus terminal in Hilo. 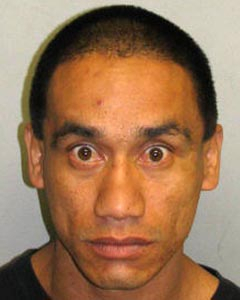 As an officer attempted to arrest him, Hauoli-Ontai became combative, causing minor injuries to the officer. Hauoli-Ontai was arrested and taken to the Hilo police cellblock while detectives from the Area I Criminal Investigations Section continued the investigation. At 3:30 p.m. Monday, he was charged with first-degree robbery, first-degree assault of a police officer, resisting arrest and promoting a detrimental drug. His bail was set at $63,000. He remained at the cellblock until his initial court appearance on Tuesday (February 11).